WEBTV USERS ALWAYS CMD R TO RELOAD PAGE! Hi, my name is Ethan. I am 7 years old. 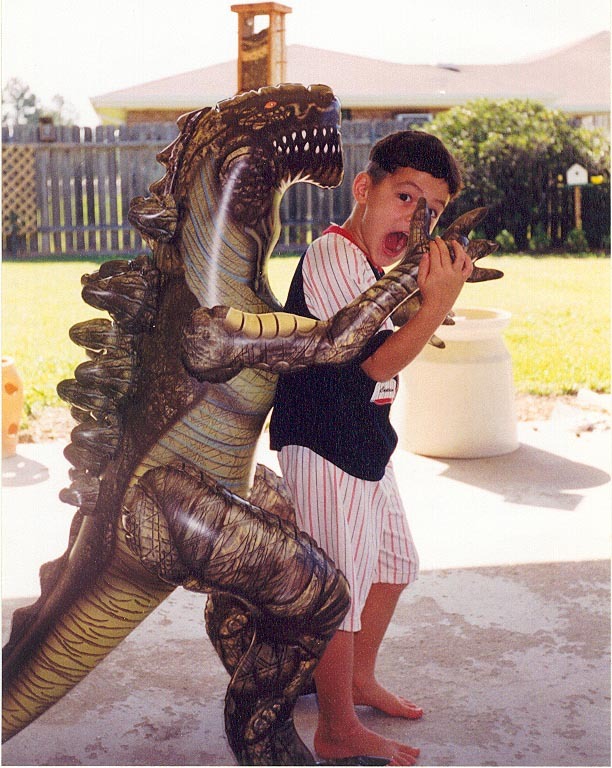 I won this fight with "Godzilla", LOL. My Grandma, bbsmitti, helped me make my page. Okay, she made it and I picked out the pictures. I love Dinosaurs, Movies, Halloween, Christmas and going to visit with my Grandparents. I know alot of things. I know that the "Saints" are a football team that upsets Grandpa Bill. Barney is loved by little kids. I am too big for Barney. "Godzilla" is not mean, he helps people. I did not like the new movie. My favorite movie is, "A Nighmare Before Christmas". My Dad loves it too! I can watch it year round at Grandma's house. My favorite holiday is "Halloween". I can Trick or Treat at Grandma's house any day of the year. Please click on the ghost to see my Halloween page. All stores, be it grocery, Wal-Mart, clothing, etc. can produce a toy surprise when I am with my Grandma. Pages where you can have fun! Just like Mr. Potatohead, make the face. Coloring Pages Lots of pictures to color online. My Stories Add your name and friends to make up your own story. The Nightmare Before Christmas! I love this movie, you will too. Children's Storybooks Great stories to read or print. Goosebumps! Goosebumps cards, information on the books. Elmo Street Elmo stories, coloring, cards, etc. Crayola The Crayola Fun page. Sesame Street Sesame Street characters. Games for kids. Tic-Tac-Toe, etc. online. Connect The Dots Play this game online. Connect The Dots Find dinosaurs here. Disney Starting point for anything to do with Disney. Kids Fun Pages Lots of activities for kids. Wonderful page with sounds of animals. More pages that are fun! Dr. Seuss Page. He is sooooo funnny. A Bugs Life! A great movie, I just love those ants! A Toy Story! One of my favorite movies. You can hear Buzz talk here. I have watched this movie mores times than any other. The Wizard Of Oz! My Grandma has seen this movie more times than any other. I love it too. She lets me play with her Oz dolls when we watch. Thank you for visiting my page. Bye, Bye. Click to see MY AWARDS!